Burnside is a traditional croft house situated a quiet location in Claddach Baleshare. The house has 2 bedrooms. 1 double bedroom and 1 twin room with extra pullout bed. Sleeps 5 upstairs , ground floor has entrance porch, lounge , kitchen / diner. Fantastic views from all windows. 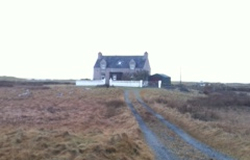 Great location for touring round island and for day trips to Barra and Harris . Great location for walking , bird watching, fishing, golf or even horse riding, shop and post office only mile away. Great place to just relax . Rental is Saturday to Saturday.